Share the post "Accept and Walk Away"
Since the day started, and having to be outside more than in, I found myself in a near constant state of hyper-awareness of the natural beauty surrounding me. I believe it all started when I arrived at one of my listings a bit early for an 8:00 am showing. With most of the City still in their Sunday morning slumber, the outdoors was delightfully lacking the sound of motorized vehicles and all the noise that goes with them. I believe if we all would slow our minds down far enough, we begin seeing things that normally go un-noticed as they did for me early this morning. Not but a few days ago I was speaking to a client about some of my quirky ways when investigating something of interest. Most people take things for grated as they are, and most of the time I do as well, but when there’s a heightened curiosity on my part, I begin looking for all the components that went together to make such a thing of interest. In today’s world, it seems there are all the more scientists and researchers who’re tearing nearly everything down to their basic components. It seems we all want quantified answers to everything so they can be placed in their respective pretty little “boxes”. My late morning and early afternoon was spent performing hours of menial labor. Even though I did get more than a workout, it was still a pleasant experience being out and enjoying the day. In spite of it being as late as it was, there still weren’t that many people out and about. Either there was something of great interest playing on the television, or there was a event taking place in North Iowa attracting the public. Irregardless, it was a welcome relief to be able to enjoy the Downtown area almost all to myself. Of course the dumpster divers are out no matter what’s happening in the world. I swear if we had an atomic bomb dropped on us, they’d still be mindlessly hanging half inside those bins while rummaging thru garbage sacks in search of kernels of value. My showing of 721 N. Delaware went well today and I have a feeling I’ll be getting an offer on it these next days. The buyers are investors, and even though I so much wanted that deeply discounted home to go to a homeowner, it looks like it may end up in someone’s rental portfolio. I’ve had a keen interest in the Oak Park district for a number of years. In these times, I believe it’s on the cusp of turning into a much more sought after neighborhood due to the big yards and the classic turn of the century homes situated there. Its location is such where people can take a short walk and be right in our Historic Downtown. I was unexpectedly visited upon by a long-time well known today whom I haven’t seen for quite some time. We had a good visit, and as always, we ended up on the subject of strange and unexplainable happenings. Her story today sent shivers up my spine while listening to a conversation being repeated from another. Seems there are portholes of energy in our area that aren’t to be messed with. She mentioned how certain “beings” manifest themselves in sort of rippled holographic forms. Seems the only way of dealing with them is to accept their presence and ignore them. I couldn’t help but agree with the idea of leaving things be as they are because one never knows what retaliation could come about by attempting to upset their form of status quo. Of course I couldn’t help but remind her of the few spiritual happenings that I witnessed some years ago where in a hard way, I also learned to accept and walk away. 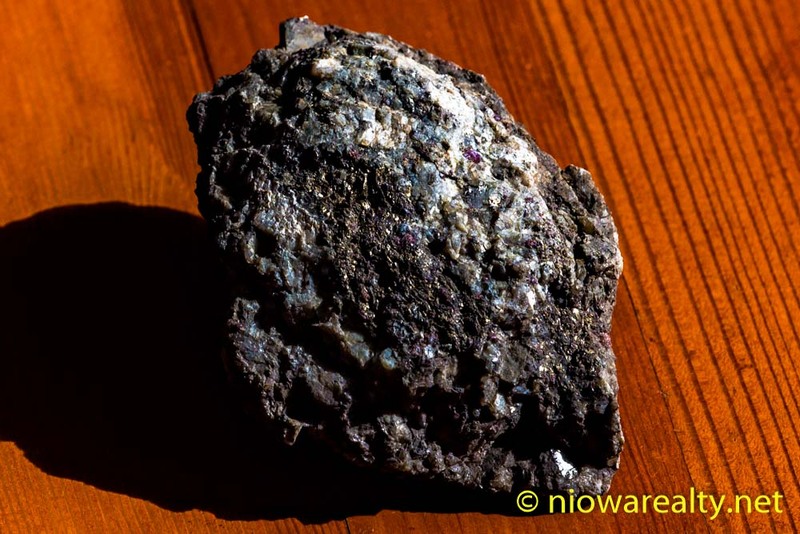 The above photo is of a handsome rock I found in a field about a month ago. It looks like there are flecks of gold in one section of it.